Did you know that you can help scientists to find exoplanets? Help scientists find exoplanets via Kepler! I am already in! Register on this website and participate in looking for planet transits (or eclipsing binaries transits) and possibly contribute to science. Planet Hunters is a citizen science project. Participants help sieve through data taken by the NASA Kepler space mission. These data consist of brightness measurements, or “light curves,” taken every thirty minutes for more than 150,000 stars. Users search for possible transit events – a brief dip in brightness that occurs when a planet passes in front of the star. 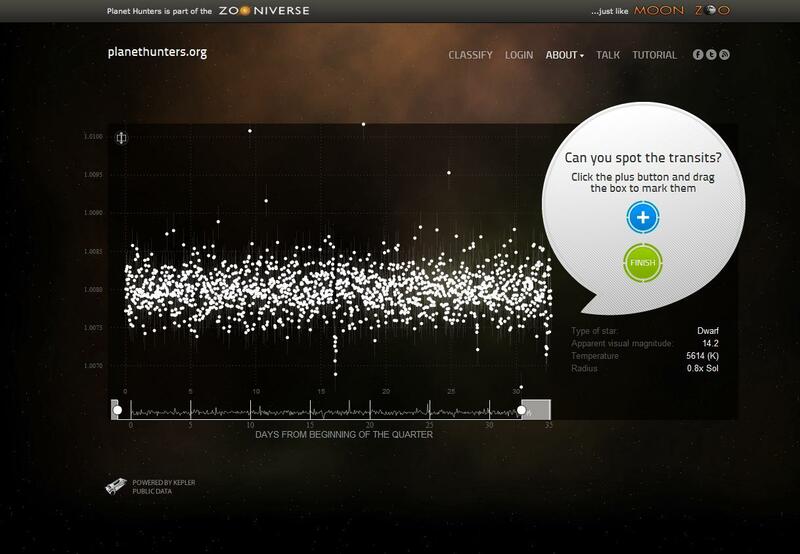 Planet Hunter participants may be better than computers at finding signals in this type of data because of the outstanding pattern recognition of the human brain. Image | This entry was posted in Astronomy and Skywatching, Discoveries, Researches and Studies and tagged Astronomy, Binary star, Citizen science, Exoplanets, Extrasolar planet, Kepler, NASA, Planet Hunters, Transits, Zooniverse. Bookmark the permalink.